Medicated wine is a transparent medicated liquid obtained by using wine as a solvent to soak out the effective components of herbs. 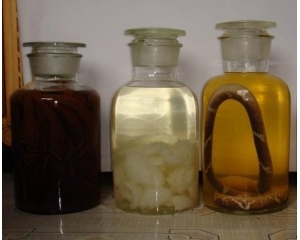 Chinese people like to use precious medical material to make medical liquor, which can reinforce body fluid and nourish the blood. Most medicated liquors are taken orally, while some are for external use. To improve the taste, crystal sugar or honey can be added to the medicated wine. Because liquor itself has the effect for stimulating blood circulation and relaxing muscles and joints, it can be used to treat general asthenia (loss of strength), rheumatic pain, and traumatic injury. In addition, alcohol is a kind of good menstruum (solvent), which may distill (extract) a higher proportion of ingredients from medical material. However, though medical liquor is good for the human body, it cannot be drunk superfluously. A frequency of 2 or 3 times a day with each dosage measuring 10 ml to 50 ml is proper for people. The history of medicated wine, an ancient and distinctive therapy of traditional Chinese medical science, can be traced back to the remote past. Through such a long history, it has been widely accepted. With the development of Chinese medicine, medicated wine also keeps developing. Records of medicated wine in oracle bone inscriptions of the Shang Dynasty (1765BC-1122BC) may be the earliest relevant records ever found. The production and application of medicated wine is valued by physicians of all dynasties. In the Historical Records, there are 25 medical cases of Chunyu Yi, a famous physician of the Han Dynasty (206BC-220AD), of which two are about treatments with medicated wine. Zhang Zhongjing, known as the Medical Sage, also included wine into his formulation when necessary to treat illnesses. The Treatise on Cold Pathogenic and Miscellaneous Diseases by Zhang Zhongjing provides formulation for safflower wine, Chinese ephedra decoction and other medicated wines. Some are made of medicines, some are obtained by decocting medicines with wine, and some are produced by simmering medicines with the mixture of wine and water, as wine can strengthen effects of the medicines and help cure diseases. In the Thousand Pieces of Gold Formulae written by Sun Simiao, the Medicine King, there is a chapter dealing exclusively with medicated wine. The work records over 80 medicated wine formulations, covering medical, surgical, gynaecological and tonic aspects. The Principles of Correct Diet by Hu Sihui, a court therapist during the Yuan Dynasty (1271AD-1368AD), is a work on diet therapy that has great influence on later generations. The book provides more than 10 medicated wine formulations that have better nourishing and tonic functions. Sorted by the natures of medicines included, medicinal liquors are sorted into medicinal liquor of animals, medicinal liquor of herbs, medicinal liquor of animals and herbs and medicinal of minerals. 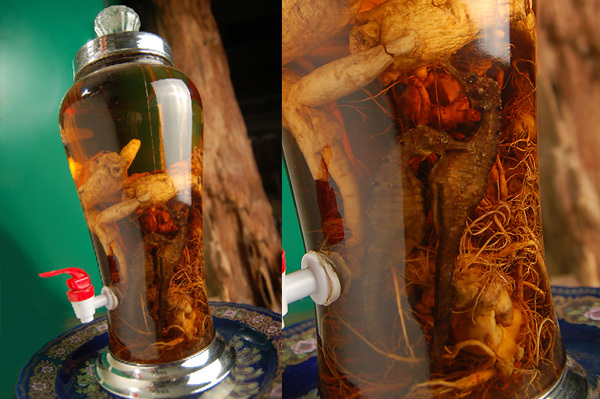 Commonly used medicinal materials are ginseng, snake, Chinese wolfberry, pilose antler, aweto, American ginseng, etc. The curative effects are different according to liquors. When making medicinal liquors, people should choose liquors of different degrees and flavors according to their likes and dislikes. Medicinal materials used for medicinal liquor can be a whole one or chopped into pieces or parts of 3-5mm length. Glass bottles with polished mouths are often selected as containers for holding medicinal liquors because they are airtight and can prevent medicinal materials from oxidation. It is better to choose bottles with dark colors. If transparent bottles are used, they should avoid sunlight. Also, there is requirement for the proportion of liquor and medicinal materials. Generally speaking, the medicinal materials soaked take up 1/3 of the whole medicinal liquor. The medicinal liquors should keep indoor with normal temperature, be airtight and avoid sunlight. Shaking the bottles several times per day is called cold-maceration method which is the most commonly used method. And there is another method called hot-cooking in which medicinal materials are cooked with liquor. It can warm yang and relieve exterior syndrome. But, it is quite easy for liquor to volatilize and the consistence can be reduced by this method and the medicinal liquor can not be kept for long. Therefore, medicinal liquors made by this method are suitable to be taken in a short time. The medicinal liquors can be used when their colors can not darken any more which means the exudation of effective ingredients has finished completely and the consistence has reached to the highest level. Generally speaking, medicinal liquors can be taken after 1-2weeks while medicinal liquors of herbs can be taken after 3-5days. Some precious herbs can be soaked for many times and new liquor can be added into bottles when there is still about 1 inch of liquor before it is drunk up.